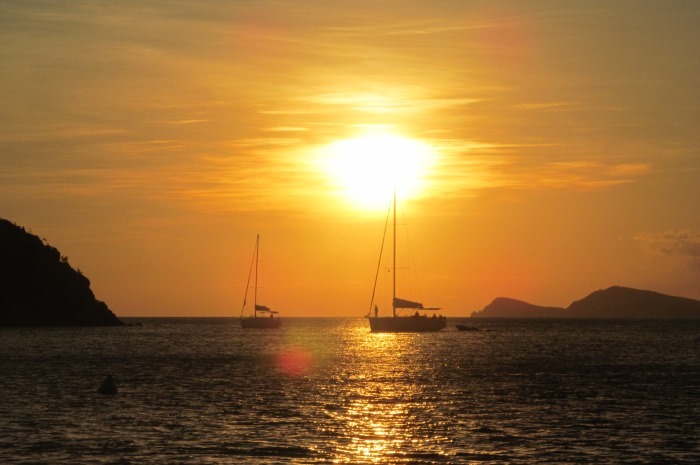 Our very first flotilla cruise took place in August 1973 in – you guessed it – the British Virgin Islands! 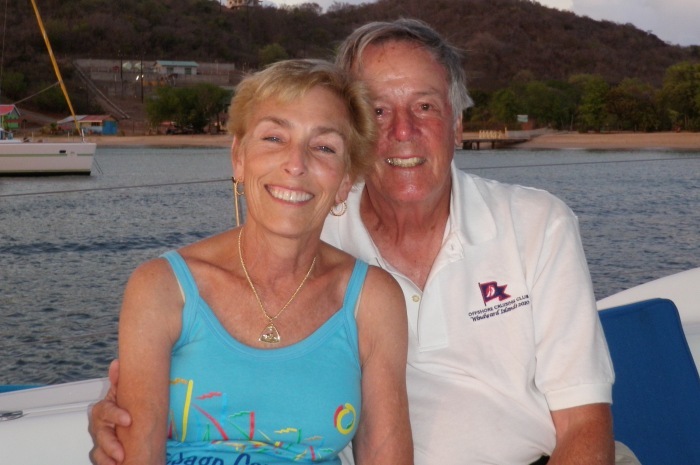 Steve and Doris Colgate, Offshore Sailing School founders, led that cruise and hundreds more. In fitting tribute to two BIG milestones – Offshore Sailing School’s 55th continuous year of sail and power training, and 46th year of conducting (several hundred) flotilla cruises – the Colgates will join Caribbean Manager, Folkert Jongkind and all of you, to explore anew these glorious verdant islands. 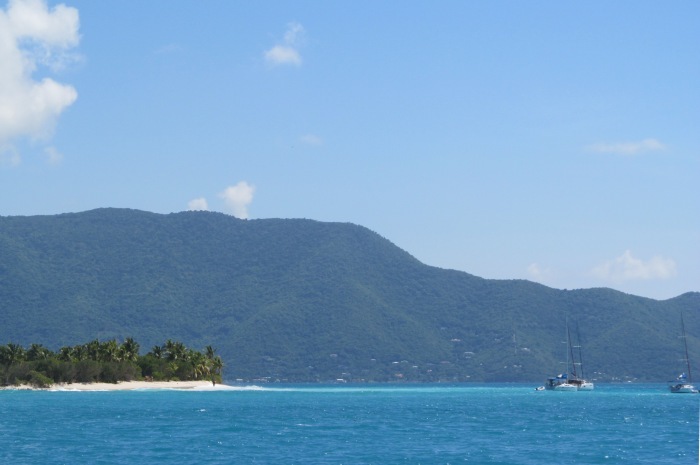 While snow falls in northern climes, our Caribbean Manager and popular BVI instructor, Folkert (Dutch) Jongkind, will lead a very special “insiders’” flotilla cruise, embarking from The Moorings Base on Wickham’s Cay, Tortola aboard six 48’ Beneteau sailing yachts and a 51’ Leopard power cat, all with four spacious en-suite cabins, tons of room to relax below and topsides, and great performance characteristics. This 55th anniversary cruise with Steve and Doris Colgate, is a unique opportunity to explore Dutch’s favorite spots – some that our students visit during cruising courses; plus “secret” idyllic cays to snorkel, and protected anchorages off the usual routes. Join this Colgate Sailing Adventures Flotilla Cruise™ and you’re sure to experience the most memorable and fun vacation under sail . . . ever! Dutch is an avid sailor and travel explorer, and one of the best-known islanders in the Caribbean! Born and raised in the Netherlands, “Dutch” (get it?) 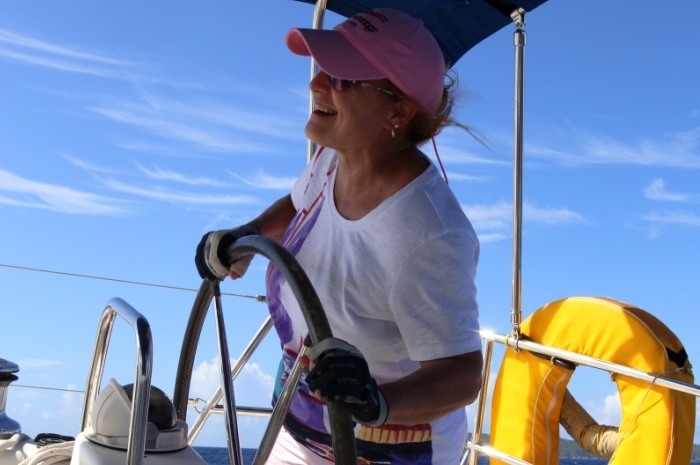 has been teaching and cruising in the British Virgin Islands for more than seven years. A Lot of Cruising, a Little Ya Gotta Regatta Racing, and a Whole Lot of Fun! On this 55th Anniversary cruise, Dutch invites you to experience his favorite rum bars, the best place for a beach lobster feast, authentic local entertainment, scenic snorkeling spots, and the most amazing sunset vistas. 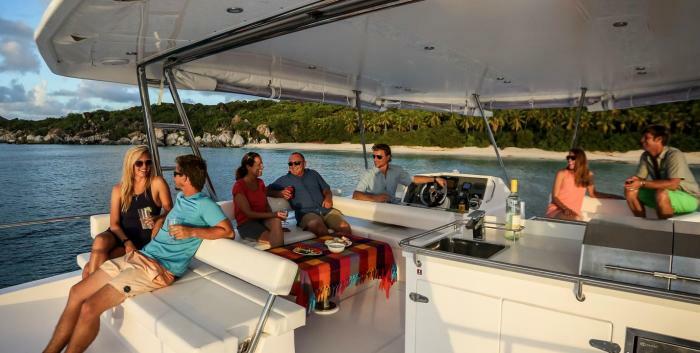 This special flotilla cruise features six gorgeous high-performance Moorings 484 monohulls and one Moorings 514 power cat. 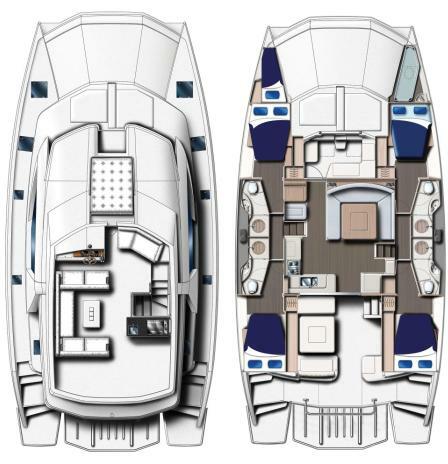 Only a few of the 24 cabins on the six monohulls remain available. The power cat is the fleet’s “mother ship” for daily navigation and regatta meetings, pre-dinner happy hours, and post-dinner parties. Dutch will lead the cruise, supported by Offshore’s Chief Operations Manager – Bryce Jackson who will captain the power cat, and Bryce’s wife Victoria. 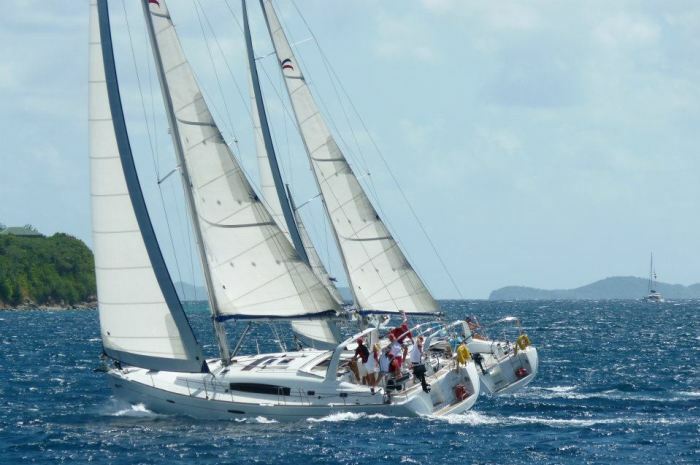 The Colgates and Dutch will sleep on the power cat and rotate aboard each of the sailing yachts during the week of British Virgin Islands sailing. who hold Bareboat Cruising Certification earned in the Live Aboard Cruising Course or Bareboat Charter Cruising Course will be considered as Skipper or Navigator aboard each boat, taking charge in tight quarters and handling communications with Bryce on the mother ship and Dutch. All crew members share in sailing and managing the yachts – taking turns steering and crewing, docking, anchoring, and picking up moorings, meal preparation and, of course, clean up. 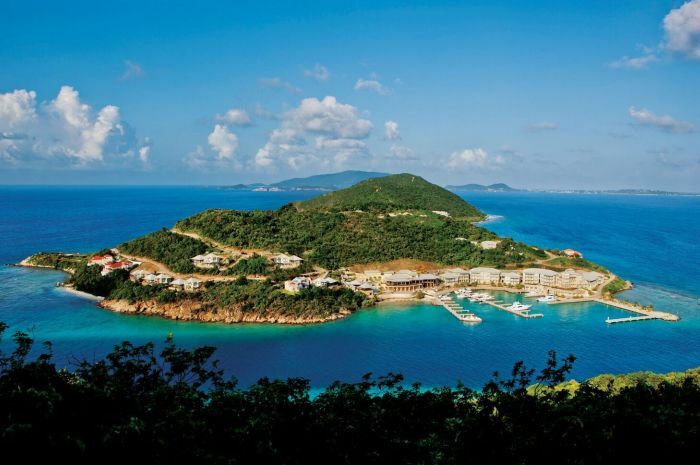 We recommend flying into Beef Island (EIS) on Tortola via San Juan, Puerto Rico, then take a taxi to The Moorings base. 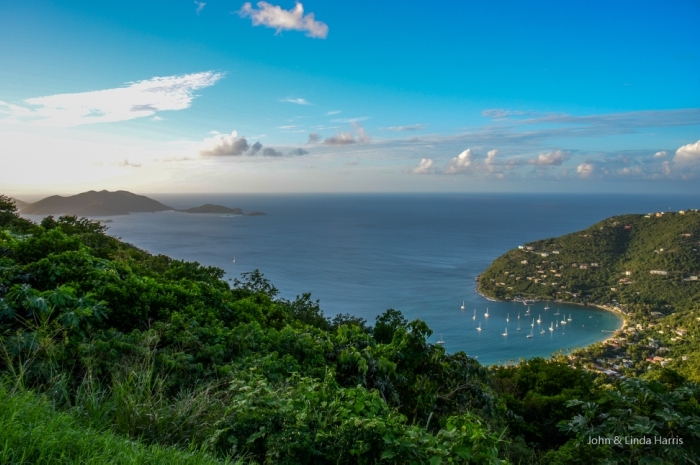 You can also fly to Cyril E. King Airport (STT) on St. Thomas, USVI, from many stateside airports direct, then taxi to the Tortola Fast Ferry for the 45-minute ride to Road Town on Tortola. If this is your choice, please book your Fast Ferry tickets well in advance. After clearing immigration and customs in Road Town, it’s just a short taxi ride to The Moorings base. The boats will be ready for boarding at 6 p.m. on Saturday, February 23, at The Moorings base in Road Town, Tortola, BVI. Stow your gear and provisions (if already placed aboard). Then join your mates and trip hosts – Dutch, Bryce and Veronica – for a joyous get-acquainted orientation and Welcome Party and Dinner at one of the restaurants in the marina. Now you should be unwinding from your travels and getting into the rhythm of island time, mon. Should you desire additional provisions, libations etc. to supplement the provisions as supplied, you may purchase these at nearby marina and grocery stores. Tonight you will sleep aboard your yacht in the marina. If your boat wants to rent a paddle board or other water toys to take you with you on this cruise, Dutch will tell you where to go to check out what’s available and you can arrange all that before dinner or first thing the next morning. 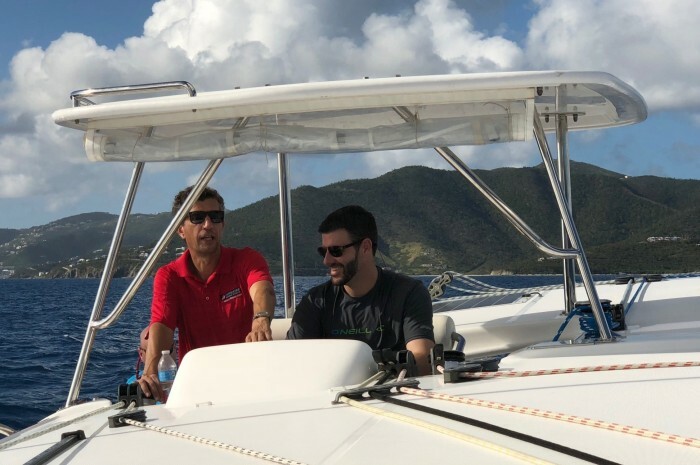 After breakfast on your yacht and the navigation meeting on the mother ship, the fleet will set sail for a fun beat or reach – to The Baths en route to Leverick Bay. This is a must, even if you’ve been there before, as the mysterious rock formations were relatively untouched when Hurricane Irma blew through last September. 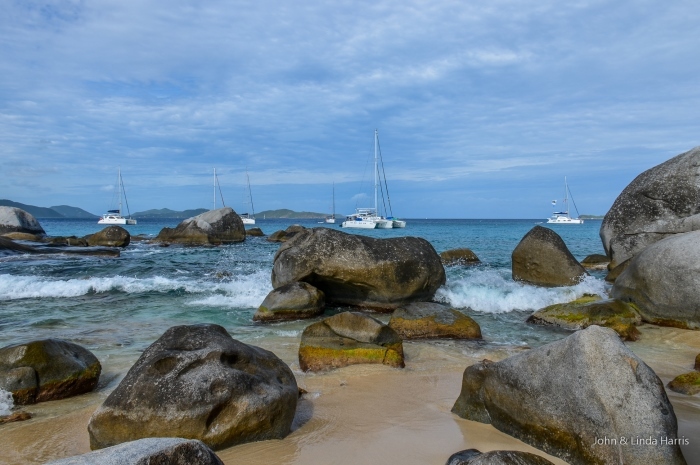 When you’ve had enough swimming and exploring, or hiking up to the restaurant for lunch and a spectacular view of the islands, the fleet will set sail again, heading to the passage between The Dogs and Virgin Gorda and into Virgin Gorda Sound to Drake’s Anchorage at Leverick Bay. Here Dutch has reserved space at the marina docks for the entire flotilla, so get your lines and fenders ready. Then stretch your legs with a fun walk up the winding paths, shop in the boutique, swim in the Leverick Bay Resort pool or just relax aboard with a good book. This is the one night a week when you can jive to the island beats of Live Entertainment at Jumbie’s Beach Bar at the Resort. Aargh, it’s a pirate-themed event matey, so consider swashbuckler attire when you pack your duffel for this trip. Tonight is another good option for dining ashore, especially at the hilltop restaurant called Hog Heaven. 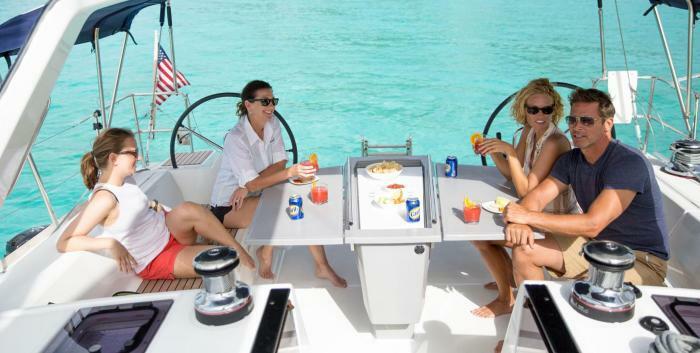 Or you and your crew mates may opt to go back to your yacht for dinner aboard. 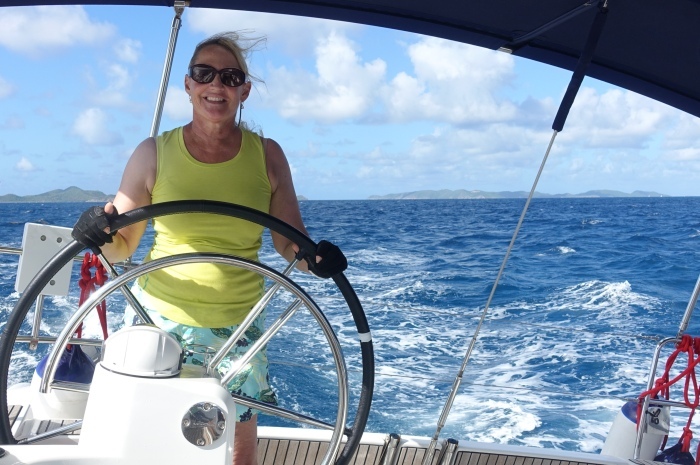 After breakfast on your yacht, and navigation meeting on the mother ship, the fleet sets sail for Anegada, a fabled sandy island few get to visit on bareboat cruising courses and regular charters. While not scheduled as one of the Ya Gotta Regatta legs on this trip, it’s a great way to work together as a crew to hone your go-fast skills in anticipation of tomorrow’s big race. When you arrive, drop your anchor and go by taxi, scooter or rental car to the North Shore for fabulous swimming and snorkeling. Tonight Dutch is hosting a very special Grilled Lobster and Seafood Dinner for all at one of the island’s restaurants, but he won’t tell you where until you get there :). Of course, other dietary requests can be arranged. Today is a Ya Gotta Regatta Day! 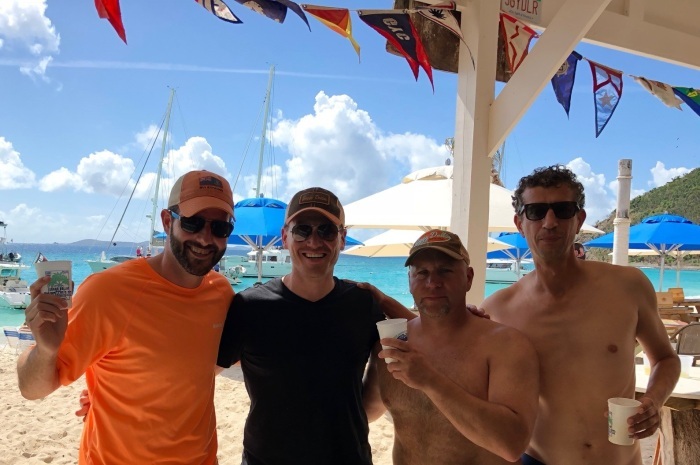 After breakfast and a regatta briefing on the mother ship, which will tow all the dinghies, the fleet heads to the starting line for a Race from Anegada, Around Sandy Cay to the Finish Line. Drop the hook and spend the afternoon swimming off the boat and beach, exploring this tiny island’s ecosystem with black sand on the windward side. When you’re ready, up-anchor and head to Great Harbor on Jost Van Dyke, tonight’s destination. 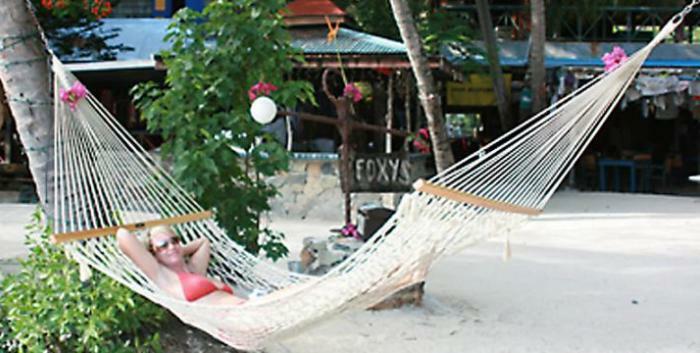 On this island there are several places to sample libations if you choose to bar hop – from Fabled Foxy’s to the Iconic Soggy Dollar Bar around the corner in White Bay where the “PainKiller” originated and was perfected in the 1970’s. Back in the harbor, rendezvous aboard the mother ship for a Fun Flotilla Dregs Party (creative appetizers made from leftovers). The group will vote on which boat was the most inventive! Then head ashore for dinner or back to your boat for another BBQ on the barbie. Another fun Regatta Day! 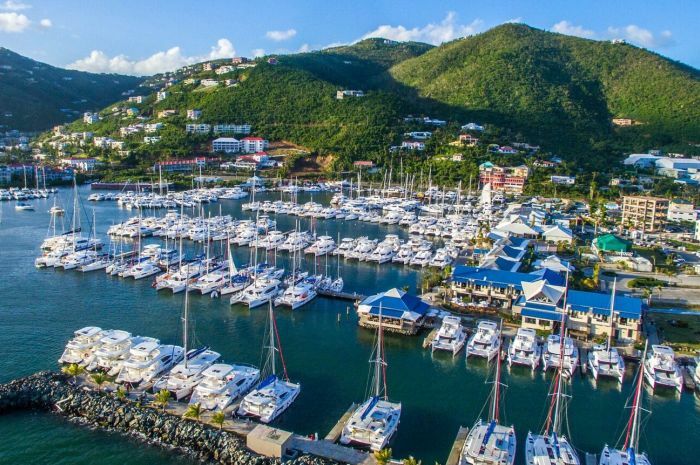 Get race-ready over breakfast, then head to the mother ship to tie up your dinghies and learn about the regatta route, then back to your yachts to rendezvous on the starting line for an Upwind Race to Guana Island. 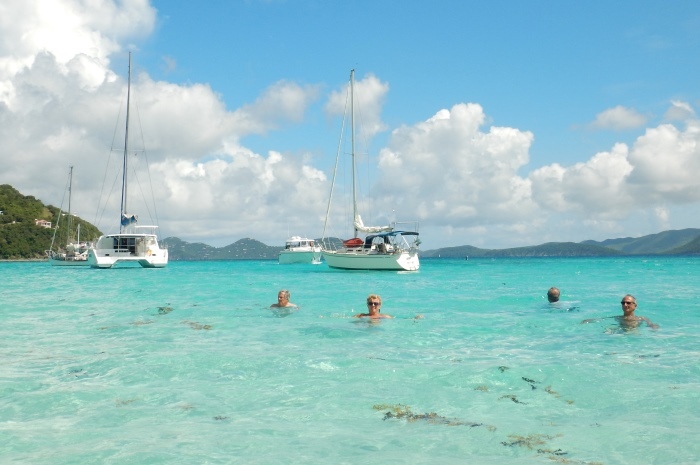 The quiet anchorage at Guana is perfect for a lunch stop, relaxing aboard, swimming and snorkeling. 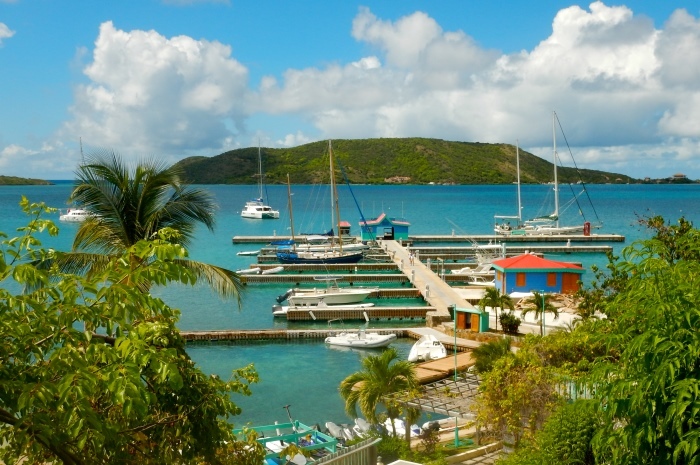 Then each boat, at its leisure, will up anchor and Sail Over to the Marina at Scrub Island Resort on Scrub Island. This beautiful Marriott Autograph Collection Property is known for its One-Shoe Beach on the north shore, but you may want to just hang out at the 3-tier pool, with water slide and swim-up bar. Later that day, Dutch has arranged for a Private Cocktail Mixology Demonstration and Competition for the flotilla group. Dutch and Bryce will present Regatta Awards Tonight at the BVI Insider’s Flotilla Cruise Final Dinner Ashore at the Resort. Another leisurely breakfast aboard is enjoyed by all, followed by the navigation briefing on the mother ship before the fleet sails to The Moorings base on Tortola, returning the boats by noon. On the sail back through Sir Francis Drake Channel, you are sure to share photos and dream of the next flotilla adventure. Best to take turns packing up before you land at The Moorings dock, where each boat’s designated skipper and navigator will go through a post-cruise boat check-list with Moorings staff. Then bid farewell to your crew, Dutch, Bryce and Victoria and head home. For those who might only have early flight options, you can leave the flotilla at Scrub and take their ferry to Trellis Island for a taxi to the airport or Fast Ferry back in Road Town. If you wish to spend a night or two at Scrub Island Resort before heading home, please let us know when you sign up and we will check on availability. 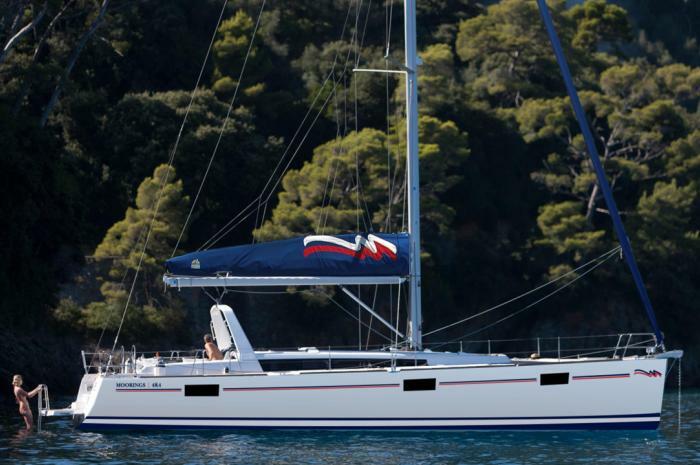 Designed by Berret-Racoupeau, and built by Beneteau, few boats like the Moorings 484 balance the thrill of sailing with such nice live aboard comfort. Each cabin has an en-suite bathroom. The layout is spacious with large portholes for lots of light, and generator-controlled, air-conditioned interior throughout. A u-shaped settee in the main salon seats up to eight. 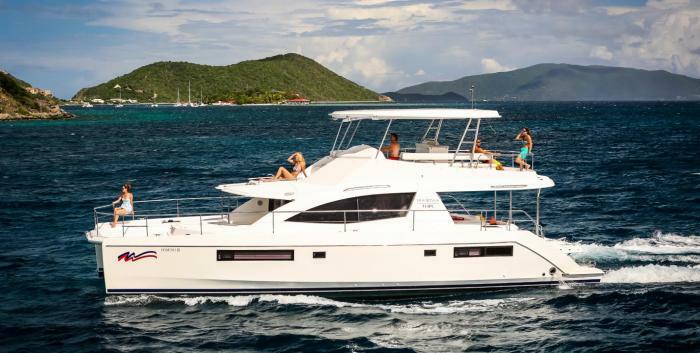 There’s a flat screen TV and big galley with everything you need to prepare meals and dine aboard. On deck an electronically controlled transom converts to a swim platform with a fresh water après swim shower. Dual helms provide better visibility for sail trim and make steering easy. All lines lead aft to the cockpit for efficient crew management. Other features include the Raymarine Navigation system, electric windlass, electric winches, bow thruster and an 80 hp Yanmar diesel engine. LOA is 47’9”, beam 15’7”, draft 6’, with 603 sq. ft. of sail area, 185 gallons of water and 52-gallon capacity for fuel. Custom designed for The Moorings by renowned yacht builders Robertson and Caine; the 514PC is powered by twin Yanmar 350hp diesel engines, allowing for easy handling from the well-appointed helm station on the fly bridge. This is the perfect happy hour venue to share sailing stories with Dutch and the Colgates, with spacious decks and an innovative fly bridge, lots of seating space, and refrigerator, stainless steel grill and wet bar. Below is a roomy air-conditioned interior centered around a main salon with panoramic 360-degree views and more space for entertaining the entire flotilla group. Below the main deck, the hulls of the 514 house four full-sized cabins, each with en-suite baths, providing a comfortable retreat for one special couple to join Dutch, the Colgates and Jacksons. Length overall is 51’, beam is 25’1”, draft is 3’3”, with 256 gallons water capacity and 396 gallons fuel capacity. Each boat has four cabins. Dutch and Bryce will put crew together on each boat based on your experience and other information given to us on your Sailing Resumes. If you know of others who are signing up for this cruise and you wish to sail with them, please let us know when you reserve your cabin. 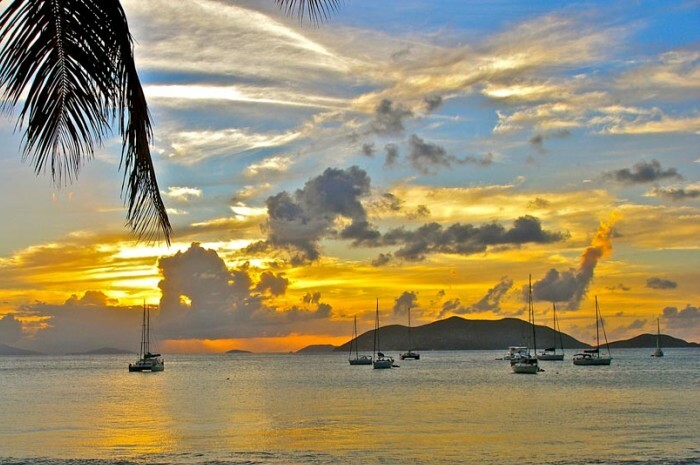 To secure your cabin, or boat, on this fantastic Insider’s Cruise of the BVI, a 30% deposit of your total package is required when you sign up. Final payment, plus a $300 refundable security deposit per person, is due October 20, 2018. No refunds are allowed on cancellations received after October 19, 2018. Please purchase trip insurance. If you do not have your own, Travelex has a good policy available for Offshore Sailing School students. Each boat will set up a kitty, with all those living on the boat sharing in the various extra costs mentioned above that are related to the boat (beverages, moorings fees for instance). There will be more information in your Handbook regarding ordering some items in advance or where to purchase when you get there before you set sail. 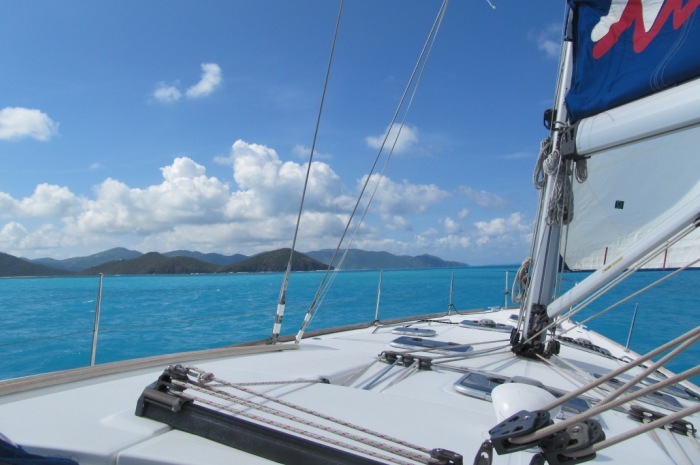 The refundable security deposit covers the deductible Offshore Sailing School is charged if there is loss or damage to a boat. If you were to dump the dinghy and damage the outboard, that would fall into this category, as well as any equipment like winch handles lost overboard or broken. In the rare case of a loss, all flotilla cruise participants share in the charge assessed by the charter agency, regardless of which boat or boat(s) incurred the loss. 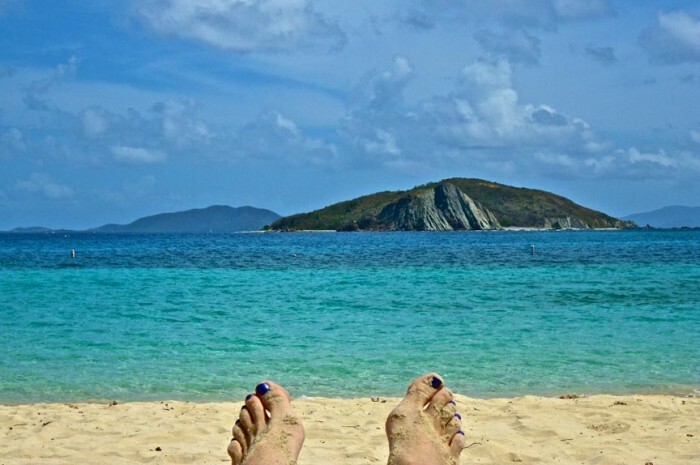 The security deposit in full or part is refunded within a month after you finish sailing the British Virgin Islands.